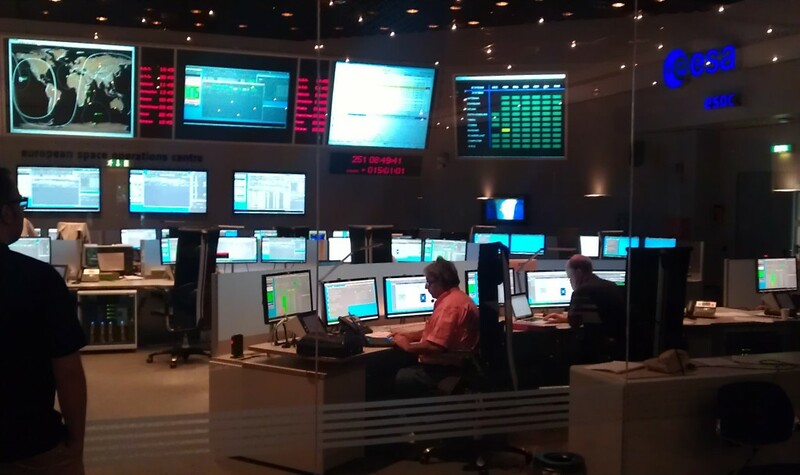 Here are some quick photos taken this morning at ESA’s European Space Operations Centre (ESOC), Darmstadt, Germany, where the MetOp-B mission operations team is conducting a simulation in the Main Control Room (MCR). 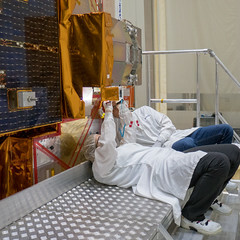 Specifically, it’s the ‘B’-team doing the sim; the team is split into an A- and a B-team so as to provide 24-hour-per-day staffing in the MCR during the ~72-hour launch and early orbit phase (LEOP) prior to handover to Eumetsat. ESA’s Andreas Rudolph (see at far right in the photo above) is the Flight Director for the B-team. ESOC’s newly renovated MCR makes it a little tough to get good photos from behind the glass in the briefing room (we didn’t want to disturb the sim too much by going in), but there are in deed engineers sitting at each of the console positions! 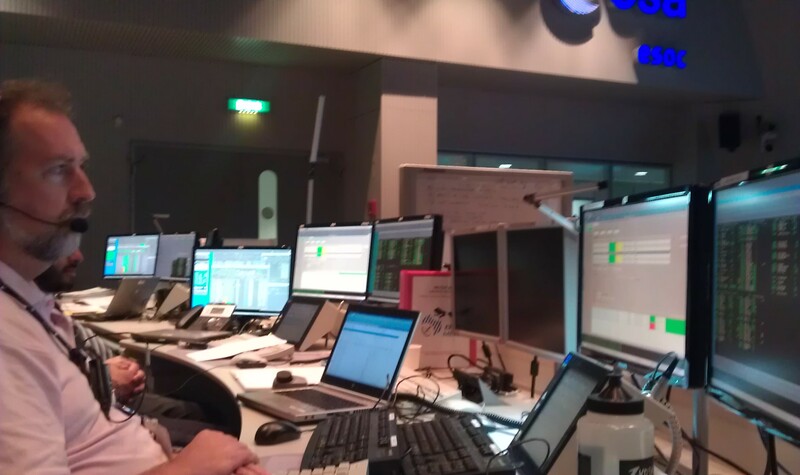 In this photo, the Ground Operations Team – responsible for coordinating the ground tracking stations, networks and ground system software – can be seen; they sit in the MCR at the left rear, behind the Spacecraft Operations Manager (SOM) and the operations engineers. A slightly blurry photo of the planning board in the Briefing Room, where the operations team as well as representatives from flight dynamics, ground stations and other supporting teams gather for review/debriefing periodically during simulations and during actual live operations. You’ll note the hand-inked discussion points and information plastered all over the board; but this is no random scribbling! 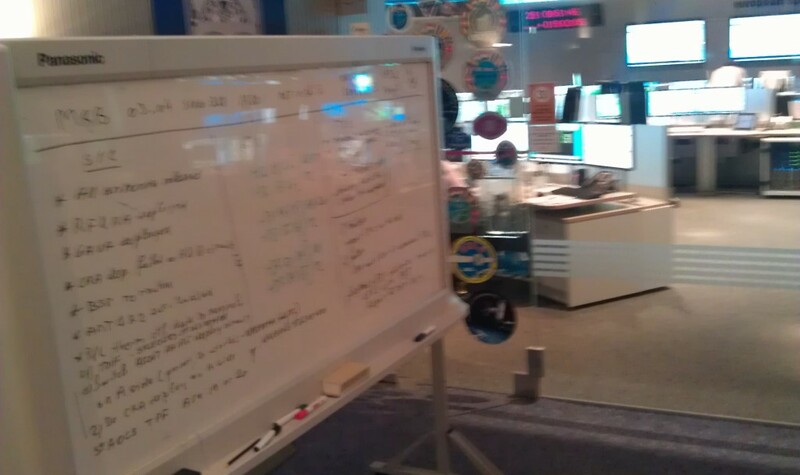 In fact, as each of the teams provide their input into how the current phase of the mission is going, the flight director marks a careful record of the discussion on the board. He or she also adds in proposals and comments on the best way forward or on how to deal with any problems or issues that have come up that aren’t catered for by standard procedures. 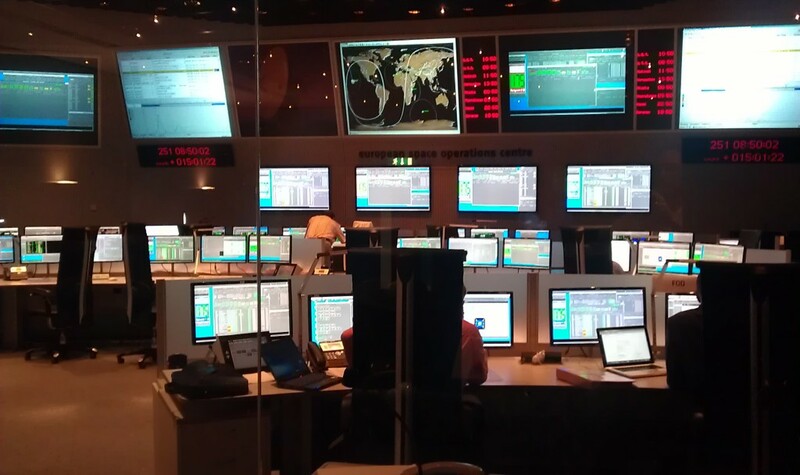 This often includes real-time information coming from the the project team (from ESTEC), from Eumetsat (the satellite’s owner/operator), the ground stations or the flight operations team, or real-time brainstorming/inspiration. When time is short (as it always is during any mission’s critical LEOP period), the information, plans and conclusions written on the board are the latest record of ‘the way ahead’. 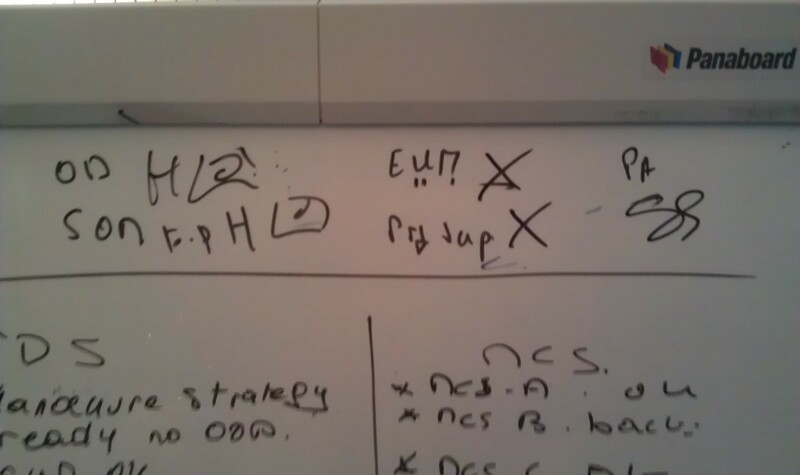 Therefore, to ensure that everyone is in agreement with the discussion, you’ll note at top right of the board the initials of each of the team leads, indicating their concurrence with the content – a simple yet effective way to ensure that nothing gets forgotten and that all the expert team leads are in agreement!